The great thing about the Grand Park Downtown Farmer’s Market is that the food is better than it needs to be. And it’s such a pleasant surprise to find smack in the middle of the downtown L.A., surrounded by the courts, the LA Times and beautiful City Hall. Take the Metro Red or Purple Line to Civic Center Plaza (Temple Street exit) and walk down the hill. On Tuesdays the market is open between 10 a.m. to 2 p.m.
It’s small, not fancy. There’s no one with a parrot on his head, like you might find at other markets. Most people are in suits. But it’s a nice place for lunch, a snack or a bag of cookies. Sweet Gourmet Nuts is there, selling delicious cinnamon-and-sugar pecans, walnuts and cashews. Delicious Starry Kitchen is there selling lemon grass tofu with garlic noodles, plus a meat entre or two. 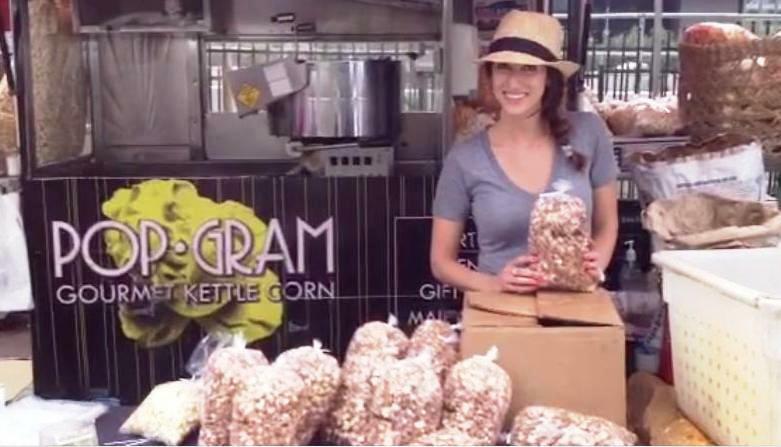 PopGram is there with upscale kettlecorn. And there’s a ton of fresh organic produce that is particularly wonderful this time of year. What’s your favorite farmer’s market near Metro? Write us at sourcemetro@gmail.com. Put RIDE & DINE in the subject field so we don’t miss it and we’ll post on The Source or our Ride & Dine map. Or fill out an easy form. Love your farmer’s market post. And the photos are beautiful! Have you visited other markets via Metro? Please share. When the Expo Line is completed, the Downtown Santa Monica stop will be 3 blocks from a Farmer’s Market on both Wednesday and Saturday mornings just west of 4th St. on Arizona Ave.